Who doesn’t enjoy life on the road? However, to explore new places while still maintaining that life can be difficult–especially when it comes to finding a comfortable place you can call ‘home sweet home’. Which is why we present to you the top 5 best travel trailers for couples on the go! 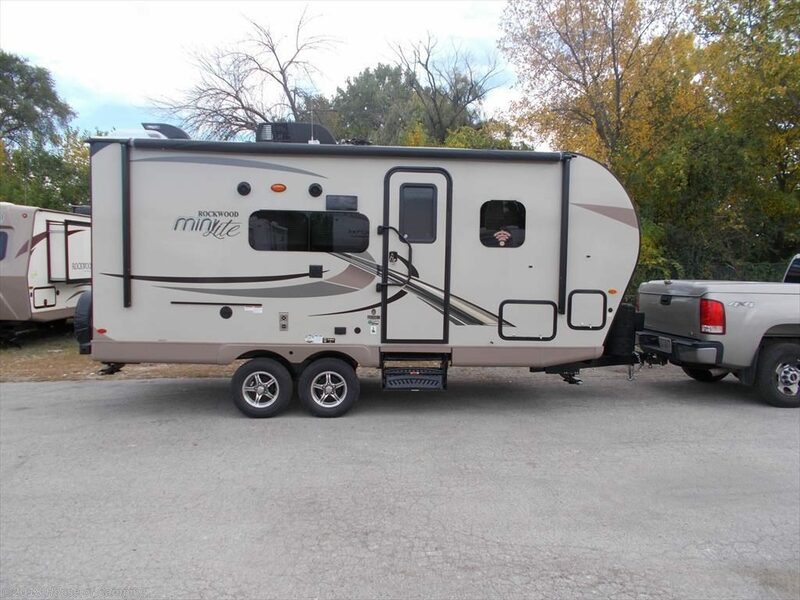 In this list, RVingPlanet has included travel trailers with couple-specific features and specifications, such as a smaller sleeping capacity but more legroom and the perfect amount of safety features. 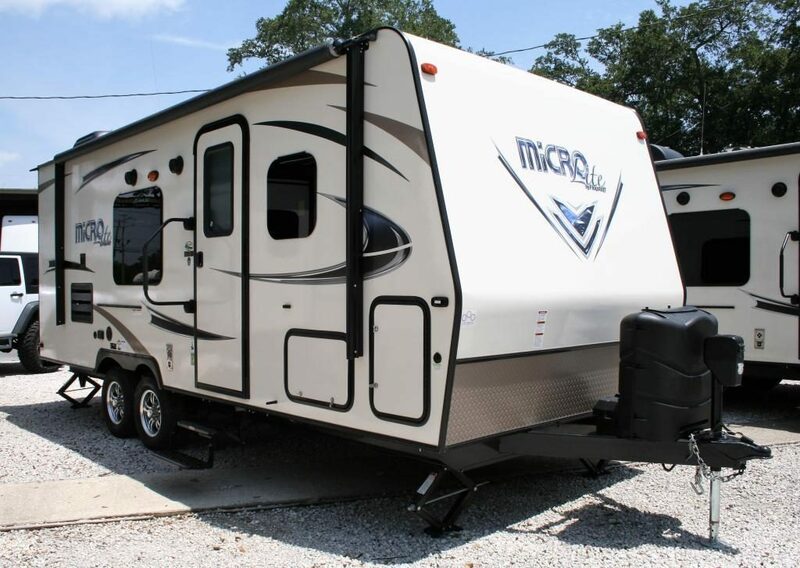 It also goes without saying that the ones that are featured have been considered great travel trailers by critics and users. Palomino’s Puma is no stranger to our top 5 lists, but the reason it made the top of the list here is due to its expansive variety of 43 floorplans, a good amount of which are within the 2-4 sleeping capacity that a couple would love. You have many options, both in terms of layout and in terms of actual physical traits. As far as features go, a few of the features are present in some floorplans while absent or slightly different in the others. Some of the standard amenities that you will see are radius baggage doors and a jack knife sofa. You can also expand its usefulness by upgrading to an 11 cubic feet stainless steel fridge and a 15,000 BTU ducted air conditioner. The bottom line? We find the Puma to be one of the top choices for the free-spirited couple. Micro-Lite is an old favorite of ours, providing a variety of features that make it perfect for almost every scenario, and this one is no different. 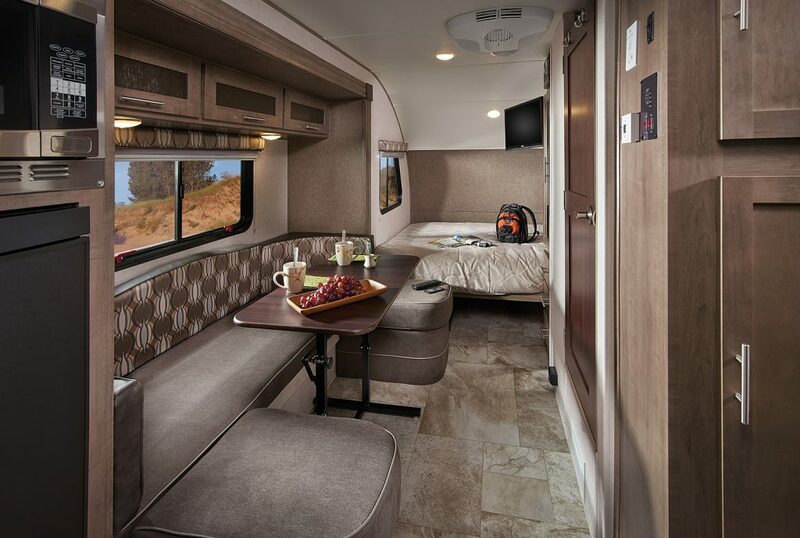 Most of its floorplans have a sleeping capacity of 3-4 people, making it ideal for couples, but at the same time it is 20-25 feet long, giving you a spacious interior. It is hard to find anything negative about the Micro-Lite’s features. From the full aluminum frame and the radius roof on the outside to the decorative valances and the on premium speakers the inside, there’s nothing you’re missing out on. You’ll also be able to upgrade to a 15,000 BTU A/C over the 13,500 BTU variant, which will be a great feature for those traveling in the south or just throughout the summer. 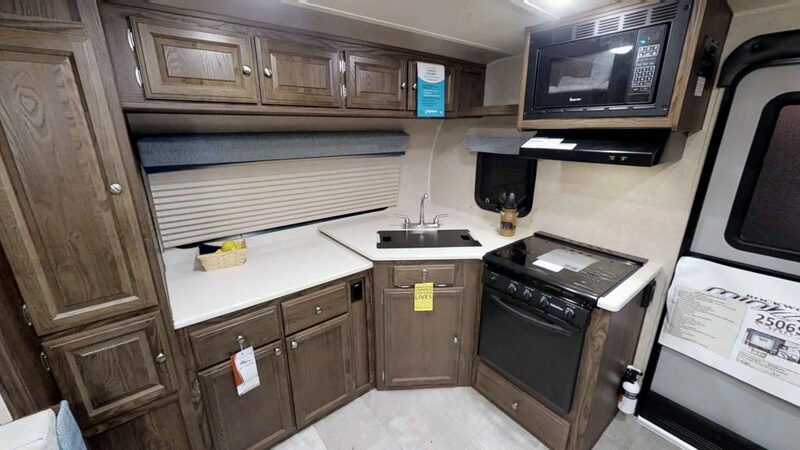 Another amazing travel trailer from Forest River’s stables is the Rockwood Mini Lite, which features 18 floorplans, and many are fit for couples always on their way somewhere. It’s also fairly lightweight as most of its floorplans are under 5,000 pounds and arrow d 20-25 feet long footprint. The Rockwood Mini Lite doesn’t disappoint as it covers every feature you could expect from a decent travel trailer, and then some! Some of these features include (but are not limited to) a free standing high pressure table, 44-inch family dinette, power awning, outside grill prep, and a lockable bed latch system. If you wish to add more to the travel trailer, it has many options–ranging from a mounted 24-inch TV to a 15,000 BTU upgraded air conditioner as well! 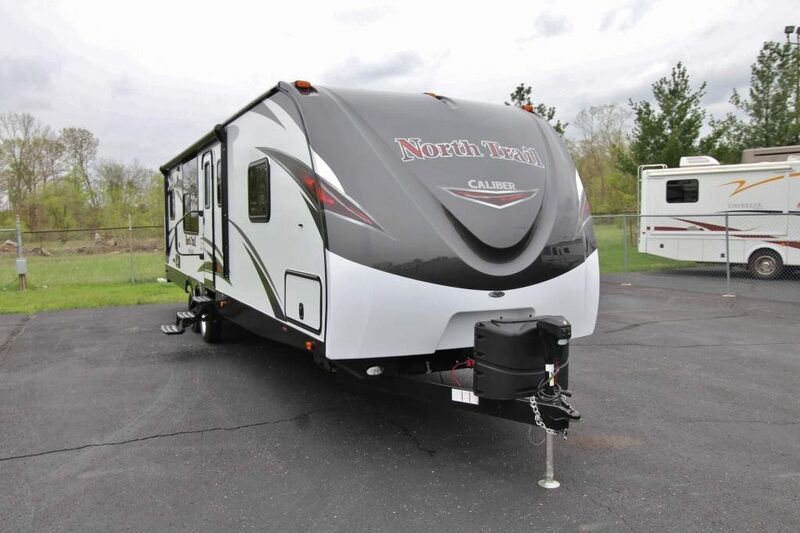 If you’re looking for travel trailers that have additional space than the other choices, then the North Trail should be perfect for you. 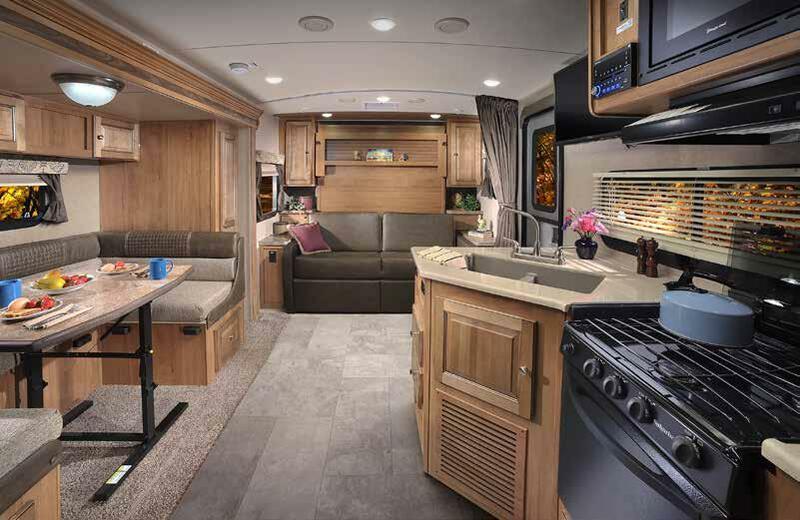 Many of its floorplans are over 30 feet and still have a sleeping capacity of 4, making it one of the travel trailers with the best space to sleeping capacity ratio. In terms of features, we found the North Trail to be a very impressive unit. 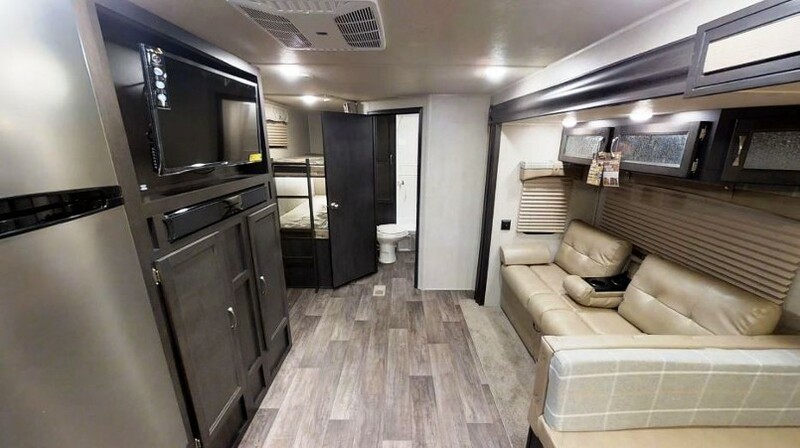 It’s got designer accent walls, a monitor panel in the bathroom, decorative glass inserts and many other features you don’t usually find in a travel trailer in this price range. You can upgrade this camper when you’re ready to. You have the option to choose a different ‘package’ that the company offers, along with some standalone options too! All in all, you can understand why we believe Heartland makes one of the most quality travel trailers out there, especially for couples on the go! 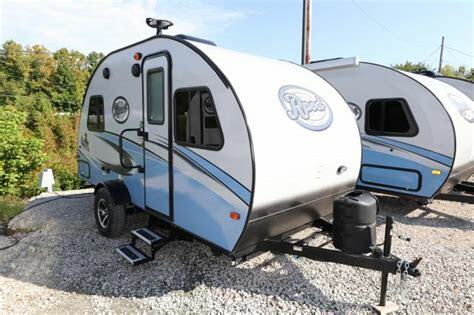 It might seem like we’re overdoing it with travel trailers from Forest River, but the fact that the R-pod is one of the smallest, most featherlight travel trailers gives it the great credit it deserves. If it’s just the two of you, the size will be perfect! It can also handle 2 more people, having floorplans with bunk beds if you’ve decided to bring friends along. Don’t let the small size convince you that Forest River has cut corners on features. While we liked the bunkhouse on the R-Pod RP-172 and the U-Shaped Dinette on the R-Pod RP-190, they otherwise share the same features. 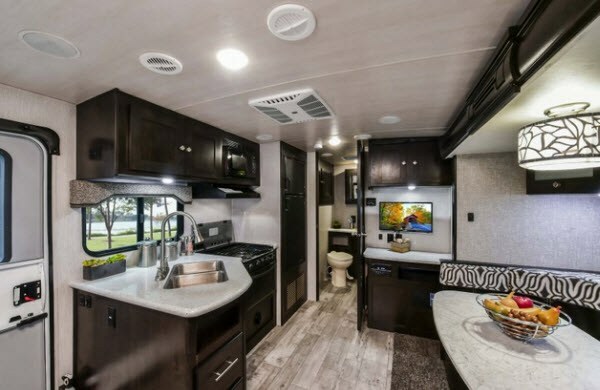 You also have the option to add a 13,500 BTU air conditioner, a convection microwave, a 24-inch flat screen LED TV among many other features, making this a versatile travel trailer as well! RVing in a travel trailer for the couple is a great a chance as any to feed your wanderlust. Having a travel trailer will give you the feeling of having a home of your own and still enjoy everything the world has to offer! 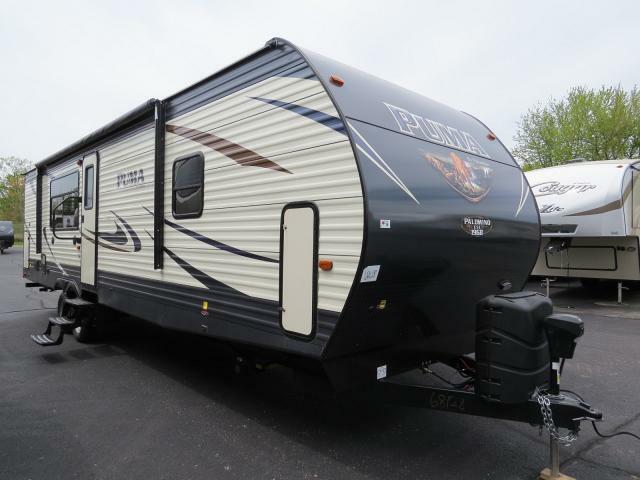 Hi I’ve been looking at your website for a camper trailer I’m interested in#3forest river rock wood mini lite.also#5forest river r-road.I’m looking at ones similar to those.I’d like some priceing.thank you.Happy Holidays.